A bad credit history doesn’t have to equal mortgage rejection. There are mortgages designed for people with a poor credit rating and there are also simple steps you can take to improve your chances of being approved for a mortgage. When you apply for a mortgage the bank or building society will check your credit report to see if you are likely to be a reliable borrower. If you have a bad credit rating your mortgage application may well be rejected. If you have ever been declared bankrupt or had a County Court Judgement (CCJ) then your credit rating is likely to be poor. More minor things can also have a big impact on your credit rating. For example, missed credit card payments, going over the agreed limit of your overdraft, or simply having a lot of debt. Surprisingly, you can also have a bad credit rating if you’ve never even had any debt. Having a credit agreement – such as a mobile phone contract, personal loan, overdraft or credit card – allows you to build up a credit history. Lenders look at this to see if you’ve made repayments on time and cleared your debts in the past. If you don’t have one it can count against you because they can’t see what kind of borrower you are. You can find out if you have bad credit easily and for free via a credit reference agency such as Experian, Equifax or ClearScore. It isn’t impossible to get a mortgage if you have a poor credit history. Some lenders offer specific products for people who have been rejected for mainstream mortgages. But before you opt for one of these products there are steps you can take to improve your chances of being approved for a cheaper mainstream mortgage. The first thing to do is stop. Numerous failed mortgage applications will damage your already poor credit history and reduce your chances of ever being approved. Also read our guide to what to do if your mortgage application is declined. Take a look at your credit report and check it for mistakes or inaccuracies. Then see the steps below for how you can improve your credit rating. Save up a bigger deposit. The smaller the mortgage and the smaller your loan-to-value, the lower risk you are, so more likely to be accepted. We would also recommend reading our guide on how to make a successful mortgage application. Once you think your rating is the best it can be, consider speaking to a mortgage broker. They will know which lenders are most likely to approve someone in your circumstances and can help you find and arrange a mortgage. With our partners at London and Country you can start the process of searching for mortgages online and/or speak to an adviser for fee-free expert advice today. Find out more with our guide: How to improve your credit rating before getting a mortgage. If your credit history means you won’t be approved for advertised mortgages you may still be able to get a home loan. Some lenders offer mortgages specifically designed for people with bad credit ratings. They often have higher interest rates and charges to reflect that you are a higher risk. You may also have to provide a bigger deposit than you would for a mainstream mortgage. Bad credit mortgages normally require at least a 15% deposit. Taking out a mortgage for bad credit, and meeting your repayments on time, can help you repair your credit history so that in a few years you can remortgage to a cheaper mainstream home loan. Multiple rejected mortgage applications will damage your already bad credit score. If you know you are likely to have problems getting a mortgage, then you should start by speaking to your bank. Explain your situation and see if they have any products that might be suitable for you. If they can’t help speak to a mortgage broker. 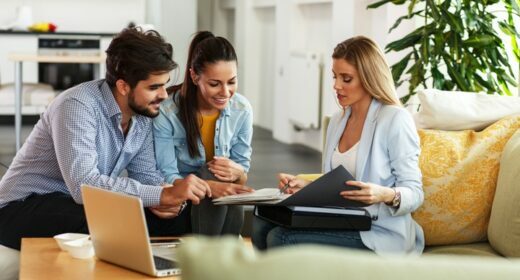 Their knowledge of the market will prove invaluable as they will know which lenders are likely to accept your application and some mortgages for bad credit are only available via a broker. A broker will be able to help you find the best mortgage for your circumstances, which will mean you get the cheapest rate available to you. Make sure in a few years, when your credit history has improved you remortgage to a traditional home loan. They tend to be far cheaper than mortgages for bad credit.